BMW Korea, the local branch of the German luxury carmaker, has started taking reservations for the upgraded electric car BMW i3 94Ah, the company’s Seoul office said Sunday. The company highlighted the enhanced driving distance of the electric vehicle of up to 200 kilometers on a full charge powered by a 33 kilowatt-hour, 94 ampere-hour lithium battery. Three colors -- protonic blue, fluid black and mineral grey -- have been added to the color palette, the company said. 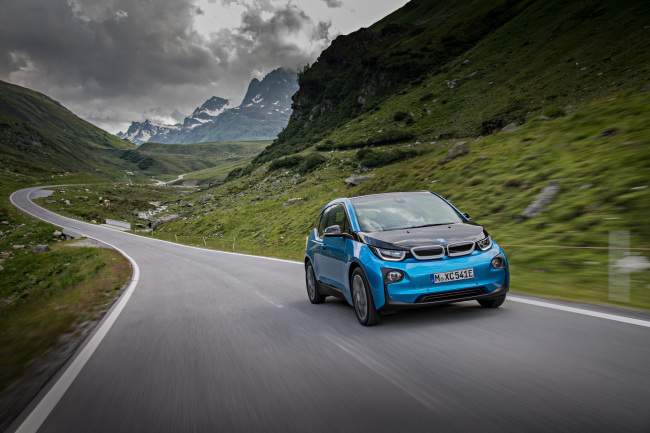 The model also comes in two trims: the BMW i3 94Ah LUX and BMW i3 94Ah SOL+. A suite interior option has been applied to the luxury trim BMW i3 94Ah SOL+, which features a glass roof and interior made with eucalyptus. An Active Cruise Control feature, which automatically adjusts speed depending on traffic, along with the Driving Assistant Plus system, have also been added to the luxury trim, the company said. The i3 94Ah LUX costs 59.5 million won ($51,860) and the i3 94Ah SOL+ is 65.5 million won. For details on reservations, customers can visit a BMW showroom or contact the BMW communication center at 080-269-2200.